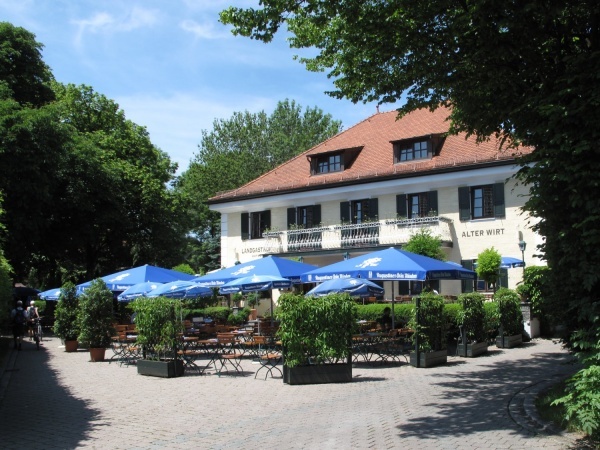 The Alter Wirt restaurant and beer garden is located in Unterschleißheim 15km north of central Munich. The historically listed building with a charming small beer garden has a village atmosphere and is right next to a small church. The history of the building dates back to 1180 when it was owned by the Benediktiner Monastery. The location has a license to serve beer since 1510. In 1920 the entire building burnt down due to arson. Following extensive renovation work in 1933/34 the house was rebuilt according to its original apperance. The beer garden has 300 seats in a self-serviced area partly shaded by large chestnut trees in addition to a smaller serviced terrace in front of the main building. The food stall offers traditional Bavarian beer garden meals and snacks. The beer sold is Augustiner at €6.00 p/Maß (April 2013). The beer garden is open from May until September between 4pm and 11pm during weekdays and from 10am until 11pm on Saturdays and Sundays. Depending on the weather, the beer garden may open already in April. This page was last modified on 18 May 2018, at 19:20.